GRAND JUNCTION, Colorado (CNN) -- In an unexpectedly personal moment during a town hall meeting Saturday, President Obama invoked the death of his grandmother as he took to task critics of overhauling health care. Obama criticized those he said reduce the health care debate to scare tactics and mischaracterizations. "I know what it's like to watch somebody you love, who's aging, deteriorate, and have to struggle with that," Obama said, pausing at times to finish his sentence. Obama's comments came in response to remarks from an audience member about the increasingly contentious tone the health care debate is taking, in Congress and in town hall meetings held by lawmakers around the country. Obama criticized opponents of health care overhaul, especially members of Congress who he said reduce the debate to scare tactics and mischaracterizations. "What you can't do -- or you can, but you shouldn't -- is start saying things like we want to set up 'death panels' to pull the plug on grandma," he said, referring to rumors earlier this week that a health care bill passed by a House committee included setting up so-called "death panels" to decide whether senior citizens get treatment. "So the notion that somehow I ran for public office or members of Congress are in this so that they can go around pulling the plug on grandma ... when you start making arguments like that, it's simply dishonest," he said. Grand Junction is Obama's third and final stop in a series of town hall meetings in the West to promote health care reform, his top domestic priority. 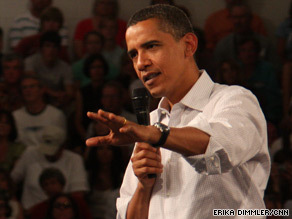 Several audience members challenged Obama on the issue of a public health plan option. Obama said that such a plan's purpose would be to "keep the insurance companies honest" by creating competition, not run them out of business. He also suggested that no final decision has been made on whether to keep the public option in the final bill. "This is a legitimate debate to have. All I'm saying is, though, that the public option, whether we have it or we don't have it, is not the entirety of health care reform. This is just one sliver of it, one aspect of it. And by the way, it's both the right and the left that have become so fixated on this that they forget everything else," he said. Obama acknowleged there is no "silver bullet" solution to health care overhaul. But he insisted that the system needs to change to avoid "a world of hurt" down the road. "There is no perfect, painless silver bullet out there that solves everyone's problem, that gives everyone perfect health care for free. I wish there was," Obama said. "What I can do is try to sort though what are all the options available, be realistic about where we're going on health care, say to myself if we keep on doing what we're doing, we're in a world of hurt." If health care reform fails, Medicare and Medicaid risk going broke, state and federal budgets will be unsustainable, "and then we're going to have to make some really bad decisions where we have no good options," Obama said. Obama spoke of the need for passionate debate on the issue, and assured the audience that productive discussion was taking place around the country, in contrast to the heated shouting matches shown on television. "Health care touches all of our lives in a profound way. It's only natural that this debate is an emotional one. And I know there's been a lot of attention paid to some of the town hall meetings that are going on around the country -- especially those where tempers have flared," he said. "But what you haven't seen are the many constructive meetings going on all over the country," he said. "I think that reflects the American people far more than what we've seen covered on television these past few days." Obama has said consensus can be reached on health care reform, but contentious town hall meetings held by lawmakers around the country have created a different impression. The White House, and many Democrats in Congress, hope that by building support in the West, the president can start to turn the tide. The region is largely Republican, but Obama made some inroads in the latest election, winning Colorado and losing Montana by just a slim margin. Obama told the mostly supportive audience that an overhaul of health care policy will protect people with insurance from the "arbitrary" policies of the insurance industry while lowering their health care expenses. Insurance companies no longer will be able to place caps on benefits or charge out-of-pocket expenses on top of premiums, Obama told the cheering crowd. "No one is holding the insurance companies accountable for these practices. But we will. We're going to ban arbitrary caps on benefits. And we'll place limits on how much you can be charged for out-of-pocket expenses," he said. The practice of canceling or denying coverage because of pre-existing conditions will also come to an end, he said. "No one in America should go broke because they get sick."